Great job, it looks awesome! Congratulations! For around 5 cases the cost will be less than $300 and closer to $260 for 10 pieces, this includes shipping direct to you. I will see if they are able to run it through their UK branch, then perhaps extra VAT can be avoided for EU folk. Case looks fantastic and is perfectly strong enough. I believe that the top and bottom bend radii will increase the strength significantly. The grey powdercoat colour provides a nice contrast with the buttons. PCB flex is no problem in the centre and the north/south edges but a bit flimsy on the left edge. I should have included the blind studs here as they are barely noticeable, and will definitely for the final case. For mine I will find a different way to stabilise it. 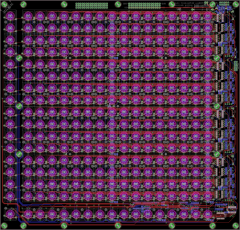 There are a few PCB errors and I think at this stage it's best to just go with new PCBs. I will start a new thread for confirming orders. How does this connect to an MIDIbox Seq v4? The preferred way is with the BLM port on a quad IIC module. This combines MIDI in, MIDI out and power connections on a DIN8 socket. There's a matching DIN8 on the BLM case; I've wired up a DIL10 header to go to the miniCore board. You can also use a DIN MIDI port on the SEQ, just connect and define which one you use. This is how I've tested mine because I can't easily get a hold of the PCB mount DIN8 to complete the quad IIC. Perhaps a question for TK: there is a small amount of "ghosting" e.g. 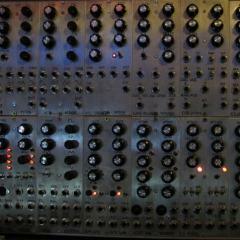 when a sequence is running one LED is dimly lit 8 steps behind the current one. Was this ever seen before? It isn't bright enough to make it through the silicone button but I should mention it and wonder if there's a possible hardware (or software) fix before going for a new board rev. 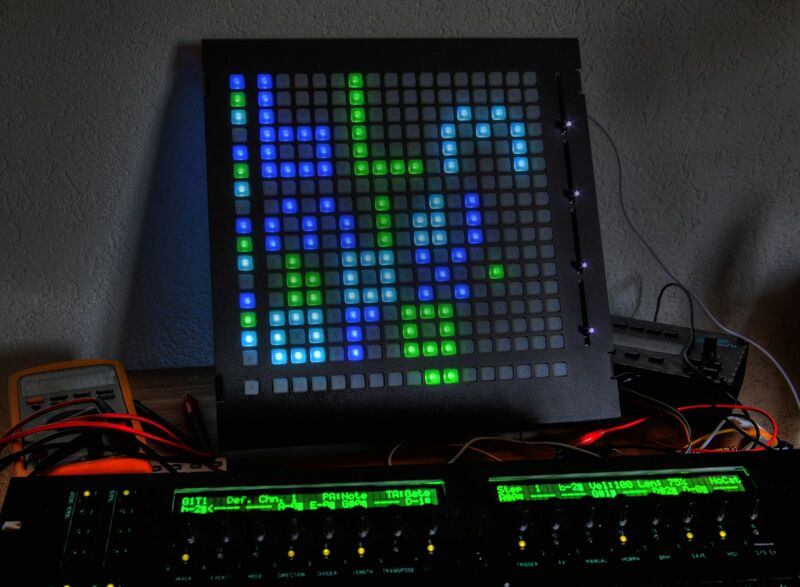 In terms of current, running the entire 16x16 group illuminated blue (i.e. step active) draws about 560 mA. Thus it would be good to have a high current PSU feeding the SEQ; for example, I have a Meanwell 2.5A switching PSU for my 5V line. Unless your musical tastes are quite different to mine, it should usually be around half of this. I did add an extra header for power, and could add a second hole for a connector on the case if requested, if your existing SEQ PSUs aren't juicy enough. Please let me know in advance if this is needed. 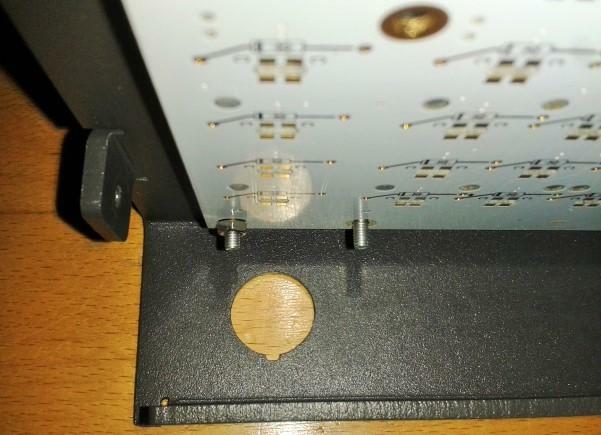 I think it would be a very good idea to add an extranal power option to the case, maybe two holes the same size as the hole on the MBSEQ back panel for a DC socket and switch. I would like to have the option to use an extranal PSU. Looks like it shouldn't be a problem to optionally add holes for power switches (I will confirm orders and collect addresses etc.). To check: the switch and barrel connector holes are 13x12 mm and 11.1x9.1 mm as per TK's Schaeffer file? I notice a lot of SEQs with a lot of different power entry requirements, I'd have to settle on one design. 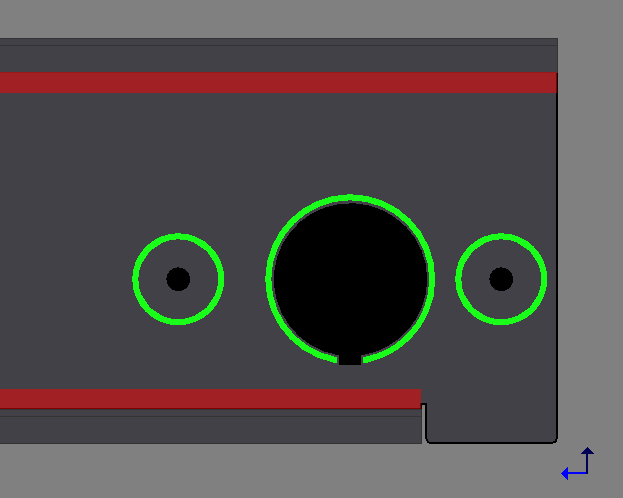 How about you keep it really simple and add two holes approx 3mm in diameter spaced approx 30mm apart on the rear that can be used as pilot holes so the owner can drill their own holes for a power switch and connector if they want? This would work for me anyway. latigid on, have you completed your build yet? I'm very interested! Is this okay for you? You would have at least 14 mm diameter clearance. Feel free to suggest another idea if you like, the red zones are essentially where the case bends. Remember that this is aluminium, not steel, so it is no trouble to drill if you wanted to wait until you have all the parts at hand. It's a bit difficult to place the holes without seeing the parts you're using. Everything is more or less working, but I should test a new PCB to be sure. If you like there's a waitlist for the next batch in the Bulk Order section. Can I request that the polit holes have their centre in line with the centre of the larger hole (which I guess is for the DIN connector) on the vertical plane? This shows the internals, I don't think it's possible to fit both in a vertical line. Horizontal I can do, the green outlines are 10 mm. But of course it's nicer to have all the cables out of the way on one side. 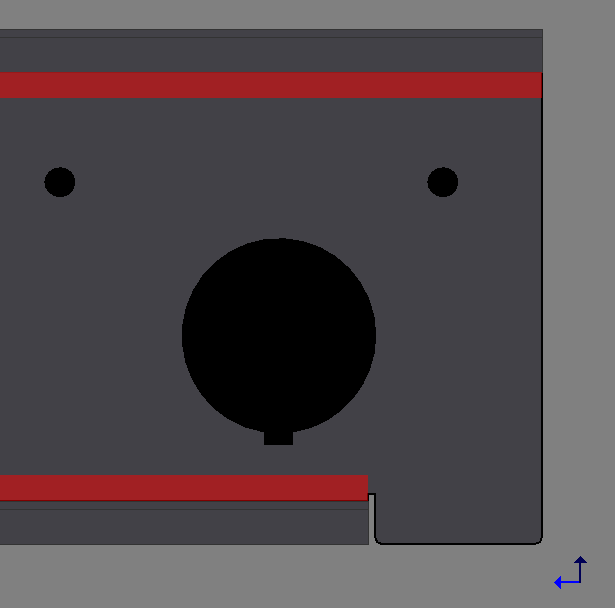 Ok, could both the holes be on the left side of the DIN cutout? Having one to the right looks like fitting a switch/socket could be a little bit tight in some cases. 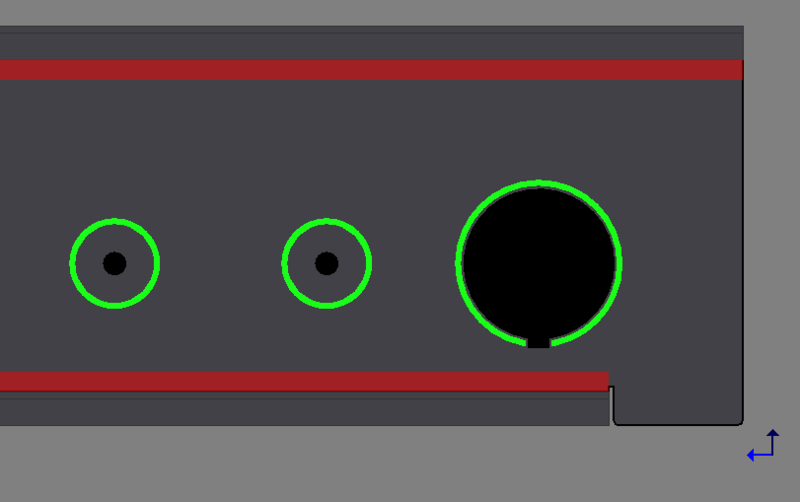 If the fitted hardware was to require a 10mm hole for example, the bezel would probably require an extra few mm. Here the hole centres are 25 mm apart, same 10 mm diameter indicated in green. Would need to implement a diode protection circuit, but there are two a "muck" areas onboard. Lamouette asked if the illumination is okay in sunlight. I shone a 10 W fluoro lamp on and you can still make out the colours although it's much better when it's a bit darker. In any case I'm happy with the brightness. Darn, that does indeed look good. Very very cool! How many colors am I supposed to see? I see four (green, blue, and two mixtures) - is this correct?